I am out of here until August! Did eat at Coal Fire over the weekend. The Margherita was outstanding; worth the trip alone. I just love that thin, charred, crispy crust pizza. Tons of fresh basil and the cheese was superb. They make all their mozzarella in- house. An absolute home run in my book. Not as thrilled with their spicy sauce but maybe that was because I didn’t have anything on the pie but cheese. I think with the right combination of toppings it could be better. Pleased to see they have some local beers available as well. See you in August. In Frederick is now open. I hope to give a review soon, but have an impending vacation looming. We’ll see. I really love pizza and I have talked about my fondness for the stuff here before. My strong preference is for thin crust New York style pizza. In fact it’s fair to say I loathe the Chicago deep dish style. So a couple of weeks ago while perusing HowChow’s excellent blog (which I have raved about before) I came across his review of Coal Fire Pizza in Ellicott City which he rates as one of the best pizza joints in Howard County. Excitedly I put the address in my GPS as I knew I was going to be flying back into BWI from a trip just around dinner time in a week or so. Alas the pizza gods did not smile on me and things got delayed with the end result of no Coal Fire pizza. However I did notice yesterday that the Washington Post did a quick review of the place and liked it. They noted the wonderful thin crisp crust and that they make all their Mozerella in-house daily! Of special interest to me the was that the article concluded with the note that “a second location is scheduled to open in Gaithersburg in February or March, says Sharoky, and the partners are considering branches in Frederick, Baltimore County and Northern Virginia.” I’ll keep my fingers crossed. UPDATE: Check out Ian’s comment below. Filed under Pizza, Restaurant- misc. As promised in my 12/5/07 entry here is a more in depth review of Il Forno. Frederick’s best pizza. Service: 86. Server was polite, prompt and kept my water glass full. This was fine for me as I don’t expect the white glove treatment in a restaurant of this level. Ambience/Décor: 80 The restaurant is nice and clean, nothing fancy. The wood burning oven is right there behind the counter and you can see them make your pizza. My only beef is they have a TV playing in the corner with no sound. This is sort of a pet peeve of mine. Why bother? This isn’t a sports bar. Maybe its just because I can’t seem to help but stare at a TV. Now I just sit with my back to it. Food: 90 The food is why we come here. They have a bunch of appetizers. We tried the garlic bread and frankly it was kind of weird- more like a white pizza then what I envision as garlic bread. As mentioned in a previous post the pizza is excellent. They have about 20 different varieties and you can get any combination of toppings on the menu. Last night we got the margherita and it was perfect. Nice crisp crust with a few scorch marks on the bottom to let you know that it was cooked in a wood oven. Good sauce, whole milk mozzarella, and fresh basil. Occasionally we get them to top it with garlic as well from the a la carte toppings. They have a 5-8 salads on the menu. Mrs. Fred and I deiced to split a Caesar’s salad. We’ve had this before and its a decent rendition of the Caesar’s salad. However this night it came topped with shredded mozzarella, just like they put on the pizza. It ended up being too much cheese. I don’t know if this is a new thing or they ran out of Parmesan, but it was not as good as we’ve had in the past. Anyway bottom line is go for the pizza and you won’t be disappointed. Drink: 78 This is my real beef with the place. The wine selection is pedestrian and mediocre. They only have a few choices and those are along the lines of Corbett Canyon. Its a shame because you can certainly get interesting wines at all price points if you put a little effort into it. Clearly they don’t care about wine. The only thing that saves them from getting a lower grade is that fact that at least they have Sam Adams and Yeungling lager on draft. Value: 88. Not expensive, not super cheap. Prices are in line with what you would expect to pay in the area. The appetizer, two pizzas, the salad, a Yeungling draft and drinks for the kids came to just under $40 with a 20% tip. Filed under Food, Pizza, Restaurant- misc. Tagged as best, Frederick, Pizza, Restaurant- misc. For my money the best pizza in our area is Il Forno. Located in the Westridge shopping center on Route 40 (1035 W. Patrick Street) it serves pizza from the wood burning, brick oven pizza. 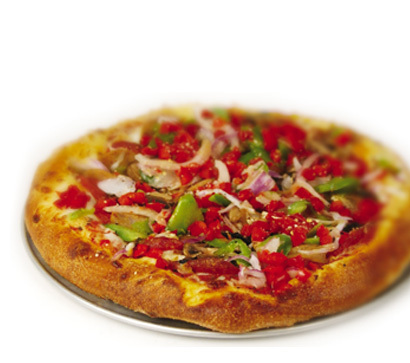 The pizza comes out with that deliciously crisp crust and smoky flavor that only a wood burning oven can create. The Margherita is sublime: Just sauce, cheese and fresh basil. I’ll have to do a full four part Fred Foodie review of this establishment in the near future. Again, let me know what you think. Tagged as Frederick, Pizza, Restaurant- misc. Pizza- definitely one of my favorite foods. And it is a source of endless debate, well to be honest argument, in the Fred household. I am embarrassed to admit that the little Fredlings prefer… Dominos. There I’ve said it. This has been the source of endless recriminations and soul searchings for me and Mrs. Fred. Where did we go wrong? These kids have been exposed to all range of fine foods and dining experiences, they’ve made their own pizza from scratch yet they still insist on Dominos when given the choice. (which in light of their preferences turns out to be not very often). Deep down inside I think its just an attempt to fulfill their sworn duty as kids and rebel against their parents values.